English Defence League supporters clashed with police near Woolwich Arsenal railway station just hours after a soldier was butchered in the streets. Elsewhere, two men were arrested following separate attacks on mosques following the murder, during which two men were reported to have shouted "Allahu Akbar" - "God is greater" in Arabic. In Woolwich, a group of between 75 and 100 men gathered at The Queen's Arms pub on Burrage Grove, where they sang nationalist songs. 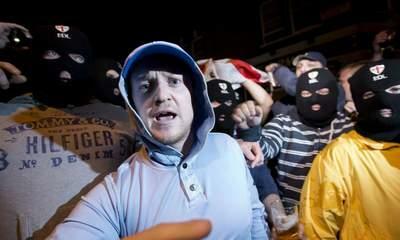 EDL leader Stephen Lennon said: "Enough is enough. Our message is enough, enough. We have weak leaders. Our police, our leaders tip-toe around this issue. "This issue is political Islam, political Islam that is spreading across this country." Bottles and other missiles were thrown at police in a square near the station. Police tried to contain the protesters and control them using baton charges. Nick Raynsford, the MP for Greenwich and Woolwich, told Sky News the EDL members should "go home and grow up". "Behaving in the way that they did, trying to foment trouble and cause difficulties in a community that has just suffered such an appalling outrage is counter-productive," he said. The crisis meeting chaired by Prime Minister David Cameron on Thursday "recognised and commended" the response of the Muslim community following the murder. Local MP Brooks Newmark tweeted: "Local mosque in Braintree attacked by man with knives and incendiary device. Man arrested. No one injured." He added: "Just met with leaders of local mosque in Braintree which was attacked this evening. Thanked local police for their swift response." Essex Police confirmed a 43-year-old from Braintree had been arrested on suspicion of possession of an offensive weapon and attempted arson after the incident in Silks Way at 7.15pm. The secretary of the mosque, Sikander Saleemy, said: "The police said it's too early to try and link it to what happened in Woolwich, but those of us who were here feel that it was some sort of revenge attack. It was clear from the man's behaviour. "We absolutely condemn what happened in Woolwich, but it had nothing to do with us. "It was an appalling act of terror - but it wasn't "Islamic" in any way. I wish it wasn't described like that, because sadly people will now start to blame Muslims." A police spokesman said they were investigating the "full circumstances" and said "it would not be appropriate to speculate at this time". In Kent, police were called to reports of criminal damage at a mosque in Canterbury Street, Gillingham, at 8.40pm. A spokesman said a man was in custody on suspicion of racially-aggravated criminal damage. Mayor of London Boris Johnson has urged Londoners to go about their days in the normal way following the murder. "It is completely wrong to blame this killing on the religion of Islam," he said. "But it also equally wrong to try to draw any link between this murder and British foreign policy or the actions of British forces who are risking their lives abroad for the sake of freedom."